Seamless Gutters - Longhorn - Screens. Shades. Shutters. Seamless rain gutters keep garages, crawl spaces, and fascia boards dry and free of conditions that support mold and wood fungi growth by controlling roof drainage. Roof drainage will direct water away from sensitive areas. A gutter system also reduces the amount of water that enters at the foundation. MOISTURE CONTROL – Keep garages, crawl spaces, and fascia boards dry and free of conditions that support mold and wood fungi growth by controlling roof drainage. SHIELD WINDOWS AND DOORS – Roof drainage will direct water away from sensitive areas. FOUNDATION PROTECTION – Reduces the amount of water that enters at the foundation wall. PROTECT BACK-FILL – Top soil around the foundation is the weakest link in foundation moisture control. Stopping top soil erosion can help prevent future structural damage. PREVENT SPLASH BACK – Rain gutters keep siding and masonry looking new by preventing splash back of dirt and minerals that stain the exterior and are difficult to remove. DECORATIVE DETAIL – Rain gutters are not just functional but can accentuate the architecture of any home. 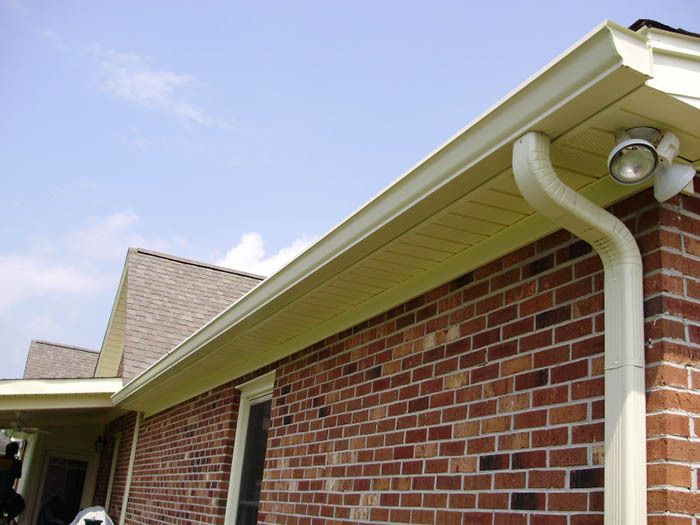 Rain gutter products are available in various styles and colors. PROTECT PLANTS AND SHRUBS – Standing water in flower beds around the home can permit harmful plant fungi to develop as well as attract ants, roaches, and termites. RAINWATER COLLECTION – Collecting rainwater is the easiest way to water your lawn, plants, and foundation. * Rustic Copper uses a unique two-coat process to achieve the appearance of aged copper. Stop climbing that ladder every year to clean your gutters. Or stop paying for multiple cleanings. Eliminate clogged downspouts that cause water damage to your home. Use the LEAF GUARD to cover and solve these problems. LEAF GUARD keeps out leaves, twigs, pine needles, and small particles from entering and clogging your home’s existing gutter system. Did You Know: 1” of rain on a 2000 sq ft roof is 1,250 gallons of water! We appreciate your interest and look forward to earning your business. We offer personalized service and affordable rates. If there’s anything we can do to make your experience a little easier, just ask. We have provided an overview of our products and services. If you have any questions or comments, or would like to schedule a free estimate, please contact us. Thanks and we look forward to hearing from you and we appreciate the opportunity to do business with you.